Dr, Tony is an amazing person. When I started seeing him just over a year ago, I had no idea I would be finishing a 5K walk. I would like to go back to just over a year ago. I could barely walk without a cane and I was bent over and in tremendous pain. That is when I heard about Dr Tony from a friend. The first few months of seeing Dr. Tony, I started seeing a difference in my mobility and level of pain was not as severe, although I still had bad days. My good days are getting more than the bad days I noticed I am not taking as much pain medication. It has been just over a year since I started seeing Dr. Tony, I now can walk part of the day without the cane. I’m off pain medication on a regular basis. I was able to join a gym, and begin an exercise program. Dr. Tony has been helping me increase my daily walking steps and encourages me to go further. There was a special walk that I wanted to be able to do, so he helped me train for the walk. So on February 11, 2017, I was able to walk the Parkinson’s Walk for Life 5K. That was the most walking steps since I hurt my back. I did a lot of training, but with the help of Dr. Tony and his staff it was possible. For some time I have contemplated a gift for you for EVERYTHING you have done for Michael and our family. Unfortunately, there is no price for what you have done. And if there was, I probably couldn’t afford it. You have given me my son back. What I CAN do is proclaim from the mountaintops the brilliance of the Blair Method to anyone who will listen. Prayers for much success for you and your business. Sarah, age 10, came to my office complaining of trouble turning her head left and right. I performed an exam and took this x-ray of her cervical spine. I was completely blown away at what I saw! A complete reverse curve at age 10. 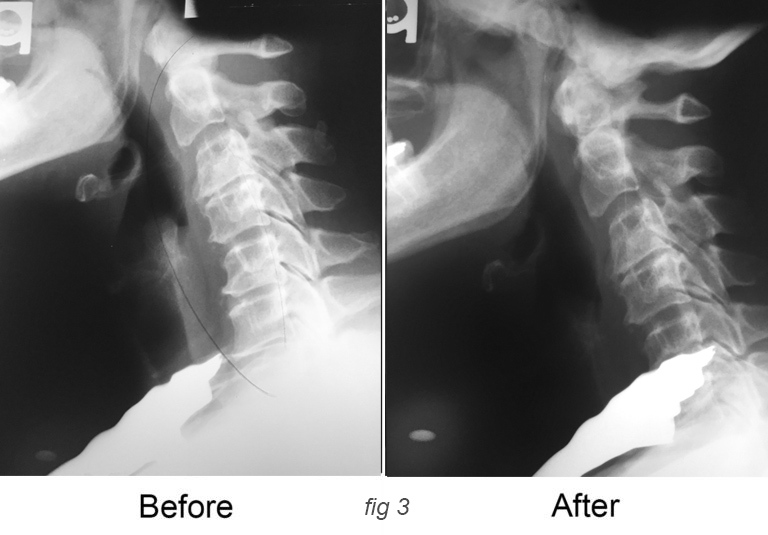 After 6 months of care she had full range of motion in her cervical spline. So I decided to retake that cervical x-ray to see if there had been any improvement. We were all amazed at the results. 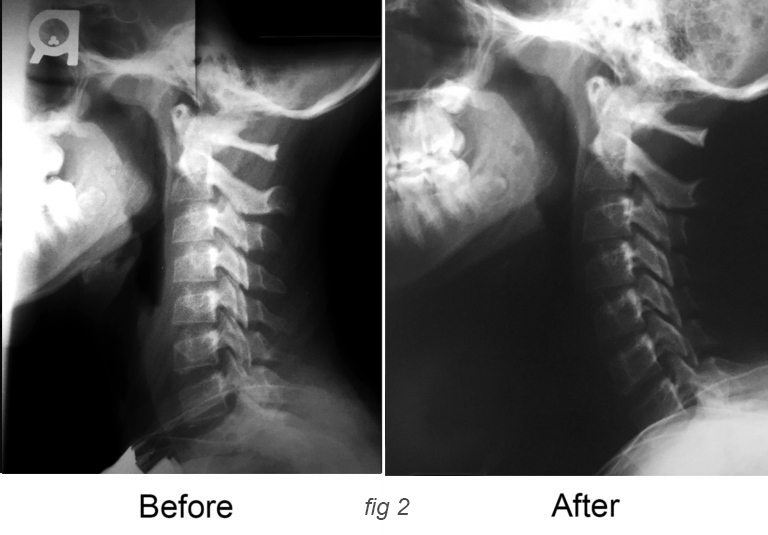 Her natural cervical curve was restored in just 6 months of care and just 5 cervical adjustments. Made this happen! 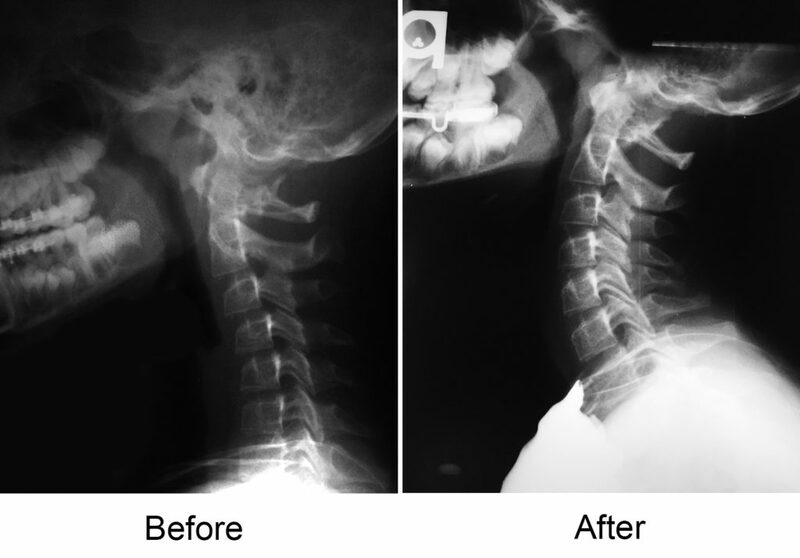 Josie a 12 yr old lacking cervical curve. I hope that my son’s testimony might reach those already posted or maybe those seeking a preventative care alternative to what they have been given. At six years of age my son was diagnosed with IIH or Pseudotumor Cerebri. He was given a lumbar puncture and put on Diamox. For one full year my son still had daily if not weekly migraines. Several calls to the neurologist, a diet change, an increased dosage of Diamox all resulted in the same result: daily migraines. If we were fortunate, maybe once a week migraines. I purchased so much ibuprofren and tylenol to stave off the migraines that my pediatrician and my neurologist started warning me about liver damage. Then on a Sunday, my son went blind. He had an appointment already scheduled on a Monday so in my own stupidity, I decided to wait until then to get him to his doc. After a very appropriate lecture from his neurologist about the damage I could have done by waiting we were scheduled to see an ophthalmologist. All was good. BUT my son’s migraines stayed. On Friday, he went blind again. We went to the hospital this time where he was checked in and scheduled for another lumbar puncture. He was drained from a 33 to a 16. Tests were run. The migraine was still there but they had to send him home. Saturday came and we were released. My son came home in tears. He was holding his head and told me he was done. I called the doc. They could do nothing. Then he went blind again. On a Sunday. Back in to the hospital we went for another lumbar puncture. He was back up to a 28. So in three days he went from a 16 to a 28. This time they kept him for three days. They ran tests. Nothing. Couldn’t figure out why he was making fluid so quickly. His diamox dose was at 500 mil 2x a day. His legs were tingly but the headaches never ceased. Then he was released. I knew knew knew if we stayed this path we were going back to the hospital again because his migraine was horrible and his eyes were swollen. He was so tired from the tears. My seven year old son started talking about maybe death being better. As a mom, I was done. 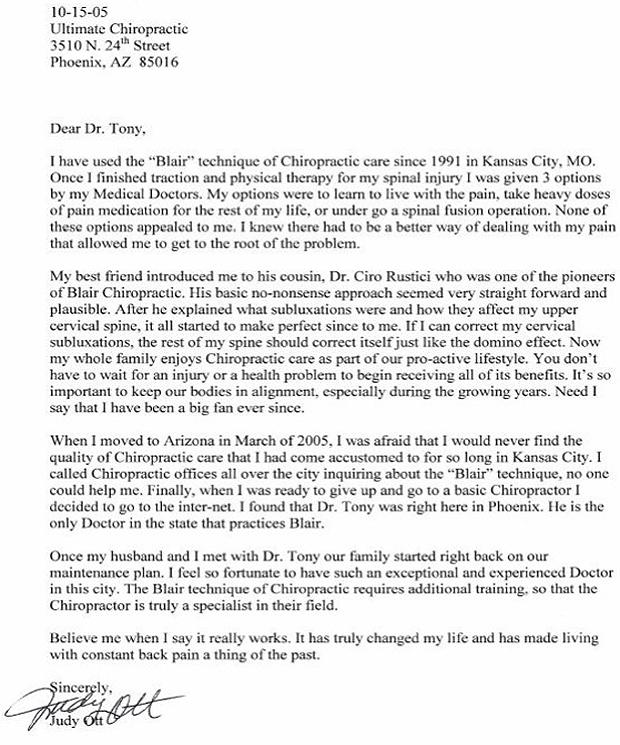 Then I remembered receiving an email about a Blair chiropractor after a recommendation a friend saw on another forum. A Blair Chiropractor is different than your regular chiropractor. A Blair Chiropractor focuses on the base or top of your spine. A BC does not pop or twist your back at all but focuses his or her attention on placing that top bone back in its original position. They are specialized and they are rare but there is a site that will tell you where they are if you need one. I called this BC on a Tuesday, his day off. I was desperate. Several chiropractors told me they couldn’t help Michael but now my husband and I were swimming in hospital debt and NOTHING was helping. I needed something preventative. And I needed it now. The BC called me back THAT DAY. His day off. He said he could help. We went in on a Wednesday. My son walked in with a blanket on his head because he was so light sensitive. He hadn’t eaten in days. Tears were streaming down his face and he was curled in a ball in my lap. The doc called us in. He looked at my son while we were reviewing our history then worked his magic. Long story shorter, after our visit, we were driving home when my son let me turn on the radio – softly, but I was able to play the radio. The blanket was off but his sunglasses were still on his face. Then that evening, the sunglasses were off but he came out into the living room and played quietly with his brothers and sisters. The next day he had rejoined his family and was no longer couped up in my dark bedroom with the blankets over his frail body. Now, a year later. My son is doing so much better! The migraines are an EXTREME rarity. He is sitting up taller. His diet is good. The diamox is decreased. In fact, we aren’t on it anymore. No blindness. One visit to the ER for an emergency LP but a visit to the chiro the next day (his birthday) resulting in an xray (which he was previously too young to receive) showed the top bone was out of place in a spot the doctor wasn’t able to manually feel with his hands. The bone was put back in properly and No.More.Visits to the hospital since. His neurologist is mind blown. His pediatrician is mind blown. We are mind blown. I am not a doctor. Just a mom. But I do recommend a Blair Chiropractor to anyone who has PsC or IIH. If you ask your neurologist they will be skeptical because they are used to TRADITIONAL chiropractors but NOT BLAIR chiropractors. Look for one in your area at Blair Chiropractic Society – Upper Cervical Care Our BC is Dr. Tony Montoya in Phoenix, AZ. I highly recommend him if you live in our great state. Thank you friends!